Most of us fondly remember summer vacation from our days in school. For those still in school, or even for some working in education, summer might still be a time that’s marked by many weeks off. Actually, it’s a popular season for most of us to consider taking some time off. This might also apply to your stock investments. That’s right, based on historical data, it seems as if they like to take summer break too. This is why there’s a saying called “Sell in May and stay away”, referring to the concept of a summer swoon in stock prices. 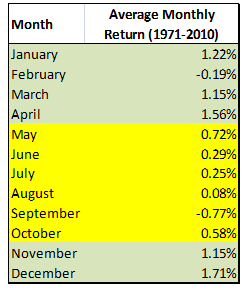 As can be seen, beginning in May, market returns tend to slide into a period of poor performance historically. Rates of return have been low in June, and trend lower each month until reaching a nadir in September. Ever heard of the September Effect? Does this mean that every year stocks perform this way? No. Does this mean that I’m specifically recommending that anyone makes specific buy/sell decisions based on this data? No. Have you heard of the concept of sell in May and go away? Why do you suspect that stocks have fared better in other months versus the summer months? Do you think we can learn from historical trends and patterns in stock prices? Share the post "Sell in May and Stay Away?" I don’t know when IRAs first began, but I wonder if they have anything to do with this pattern. I suppose a lot of folks fund their IRAs after the first of the year–for that year, or the prior year, before the mid-April deadline–and a lot of that money would go into stocks. With demand for stocks up, prices would tend to rise more than otherwise. Summer begins soon after tax season ends, and IRA contributions probably tail off until January the following year, roughly corresponding with the poorer return months. Just a thought. Kurt – I like these types of theories, they get the mind working. It’s another reason I enjoy blogging, getting new perspectives. Greetings there. First off I want to say I love your site with the sound investment, wealth creation, and preservation ideas and tips it provides. Now on to your blog topic of the day. I have been studying and following the principals of Fusion Analysis (Fundamental+Technical+Behavioral-Finance+Quant Analysis) to employ in my investment strategy and I have come across this subject in many of my studies. To first begin, there is a popular series known as the Stock Trader’s Almanac published annually by Jeffrey & Yale Hirsch in which they always cover this topic and other popular Wall Street sayings. Statistically they show in their book that Investing in the Dow Jones from November 1st to April 30th “each year and then switching into fixed income for the other 6 months has produced reliable safe returns with reduced risk since 1950.” -Quote from their book. They also show in the book that statistically on average, November, December, and January have the best three-month span in market prices since 1950 due to the quarterly operatiosn of institutions. Another book I read called “Stock Market Trends” by Jay Kaeppel. He mentioned that the trend was first recognized and popularized by Yale Hirsch but dedicated a whole chapter with over 50 pages going into detail with statistical break downs by months and years along with charts. He goes into summarizing how the summer vacation is a ritualized routine in business in America. Every year millions of American families pack up the family car and take a summer vacation and this is especially true of the mutual funds, pension funds, banks, etc. He says if so many people take off from work during the summer months then why would it be surprising that in essence the stock market does the same thing too if the market is made of up human participants. Sam Stovall in his book “The Seven Rules of Wall Street” has as Rule #3 – Sell in May and Then Go Away” in which he spends 20 pages in which he says a search on the internet will return an Old English saying: “Sell in May and then go away. Do not return to St. Ledgers Day.” He states in his book that the reasons for the semiannual softness could be due to 3 reasons, Vacations, Earnings reality overtaking optimism, and A lack of capital inflows. He then provides an investment strategy on how one could conduct a sector rotation of the 9 sectors from the S&P 500 using the cyclical sector ETFs to profit off of the rotation during the season of softness. It would behoove anyone who wants to gain an edge on the market to study the seasonality patterns of financial markets as my observations from books mentioned above, and involvement in the market does show that there is a predictable movement based on Four-year, to Annual, to monthly, to weekly, and daily cycles that correspond with human activity in politics and business. You even hear CNBC on-air personalties mention about the low volume during the summer months and that they can’t wait until the big fund managers return from their summer vacations to see which way the market will resume trending. How long this trend continues though remains to be seen. Kevin – thanks for the comment! It’s interesting how the market does seem to show such patterns, and not just in terms of performance by month. Whether or not there’s enough of a sample size for each of these patterns to matter is perhaps up for debate. However, it’s good to pay attention to the historical behavior and try to learn what we can about what that might portend for the future. I’ve been seeing sell in may and go away in action for the past few years except that sometimes May starts in March or in April. There’s defintely a market cycle out especially when investing in resources. BTI – that’s interesting, I hadn’t considered the resources market. Good line of thinking, that different markets might actually have different cycles and historical price patterns themselves. I hadn’t heard of this saying before, but it makes a little sense. Here in Houston at least, everyone gets crabbier and more pessimistic when it gets hot. Mr. BFS seems to invest our money based on specific stock’s data, so it may not really apply to us, but good to know. Crystal – well, whatever the reasons, I agree that it’s good to know about such data! It’s one of the more interesting concepts around the market. The stock traders almanac did a statistical write up about it but just for election years and found no real difference. Just guessing why, a lot of corporate spending budgets are reset in January freeing up cash for immediate needs and new planned projects. Whatever is left needs to be spent by year end or returned to the coffers. But I may be totally wrong. JP – I hadn’t thought of that one. Interesting. It’s often fascinating how there are many theories around such data patterns that need interpretation. I haven’t heard of this either, but it seems to make sense for reasons mentioned in the previous comments. It is always great to learn different things about investing and such, since I really am clueless in that arena. Sherrian – always good to keep an open mind, I agree! There is less trading volume in the market in the summer, leading to wider swings in prices. If you are a jumpy investor, sell in May (assuming you are talking about selling in a retirement account). If you are a long term investor, don’t sell in May because as you can see in the chart above, the long term average is still positive. James – long term small investors probably aren’t timing the market in terms of trading (buying/selling) based on such patterns. Sometimes, situationally, I wonder if might be good to think of this. I’ve never heard this before either. Nonetheless, it’s very interesting statistics. Number don’t lie. Considering the recent run-up in the market, this summer may prove your thinking right. I’ve heard term ‘Summer doldrums”; I wonder if it relates to this stats. Shilpan – summer doldrums, it sure seems like it historically. While we are taking vacations, stocks might be doing the same! Nicole – interesting, a real life application of this knowledge!